The Best Bait For Catfish: What Is Recommended For Catching Them? What Is The Best Bait For Catfish Fishing? Most experienced catfish anglers have come to understand which is the best bait for catfish that will be the most productive, while facing any circumstance in any condition that may arise. However, are the best catfish baits a matter of fact or opinion? Catfish have an extremely keen sense of smell, and generally aren't too finicky eaters. Being that they are primarily bottom feeding scavenger fish, they will often smash on any type of bait, or almost anything which resembles or smells like food to them. And occasionally, they will even hit lures, including top water plugs or flies, especially in fast moving waters. If you were to ask around, many catfish anglers would gladly voice their opinion about which is the best bait for catfish. More than likely, you'll receive a wide variety of opinionated answers. A lot of the same, and a few different ideas as well. Some baits for catfish work extremely well, while other baits may produce nicely for only certain species of catfish under limited provisions. Is Chicken Liver The Best Catfish Bait? 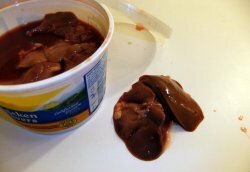 Chicken liver is one of the top catfish baits on my list. Many grocery stores carry it and it's really cheap. And yes, I often use it. I recommend to bait a nice sized chunk of chicken liver on the hook. Wrap miracle thread around the chicken liver and the hook. A few times shall be efficient, just enough to hold the bait on during the cast and preventing the catfish from stealing it. You can opt to tie it off but it's not always necessary. 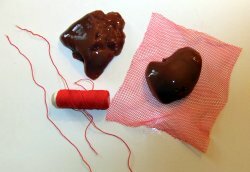 You can substitute the miracle thread for sewing thread. The miracle thread is elastic and seemingly easier to work with for me. Other options you may try, all of which I've experimented with, can be to use a square piece of pantyhose, cheese cloth, or any type of small netted fabric. Cut them into about three to four inch squares, place the chicken liver on them, fold the corners and tie it to the hook. What about the messiness? Wear gloves or simply rinse your hands in the water. I always bring a couple of hand towels to help remove the bloodiness. When I'm completely finished fishing for the day, I'll use a hand sanitizer before hopping into my vehicle. Chicken liver is probably the best bait for catfish because you can catch a bunch of fish with it. This can be positive, or even a negative for some. The majority of catfish will be smaller. But this should not pose a problem just for the pure enjoyment of catching many fish, and it's a great way for learning how to catch catfish. Besides, smaller catfish provide better table fare as far as taste goes. The larger fish will often contain more chemical contaminants. To seek much larger catfish, such as blue catfish or flatheads, more realistic larger baits will be the best bait for catfish. 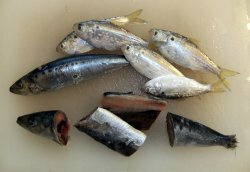 I like to use shad, sardines and anchovies. Any type of oily fish will be great. The fresher, the better. You can purchase these or catch your own bait fish. Catfish also love cut chunks of bluegill, sunfish and minnows, just to name a few. I'll put the bait fish on the hook either whole, cut into chunks, or butterflied. Cutting the bait will allow for the sweet bloody aroma into the water column, attracting the catfish over for a nice little treat, eventually being awarded a personal "meet and greet" with you at the end of your ultra sharp hook. Don't be afraid to experiment with other types of baits for catching catfish. 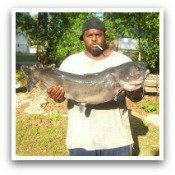 Who knows, you may develop your own personal preference for the best bait for catfish. You can create your own homemade catfish bait. A few things that you may want to try are, hot dogs, clams, crawdad tail meat, shrimp, cheese, dough balls, or cubed bar soap. Anything which omits odor will often work. I've even caught catfish using roast beef. Want more catfish bait ideas? Submit Your Catfish Pictures And Stories Here.